The Xmas show at Watters Gallery opens on Wednesday night at 6 pm. I have 3 of these new bowls in their end of Year show. I have been developing the Balmoral Blackware body that I make by washing rotten basaltic gravel in water then throwing away the gravel to obtain the micron thin film of hydrated ceramic dust off the surface of the rotten stone fragments. I have two pieces of single stone white, unglazed porcelain in this show, they are quite subtle and delicate. I have explored both high footed forms as well as seemingly footless forms like the traditional ‘tenmoku’ forms. I was lucky enough to spend time in China earlier this year, studying both single stone porcelain as well as a trip up-river, in China to study the ancient ‘tenmoku’ ware sites. 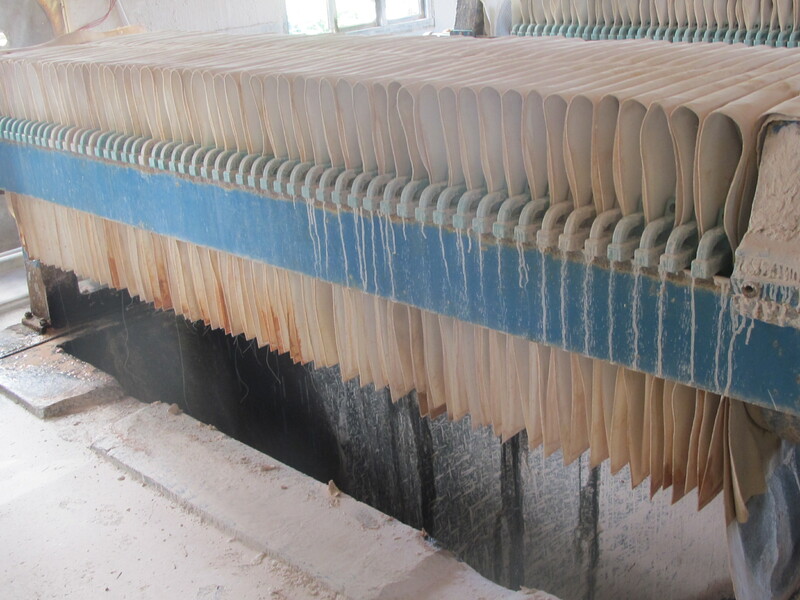 Jingdezhen in China has a very long history of making porcelain. Over one thousand years in fact. They had already celebrated their millennium of porcelain making when I was working there ten years ago. The special thing about this place is the clay. It isn’t clay! What they use here is a ground-up stone. When they crush and finely grind the local stone down into a very fine paste, it becomes plastic. This is like magic. Stone doesn’t usually become sticky and plastic like clay unless it’s very special. 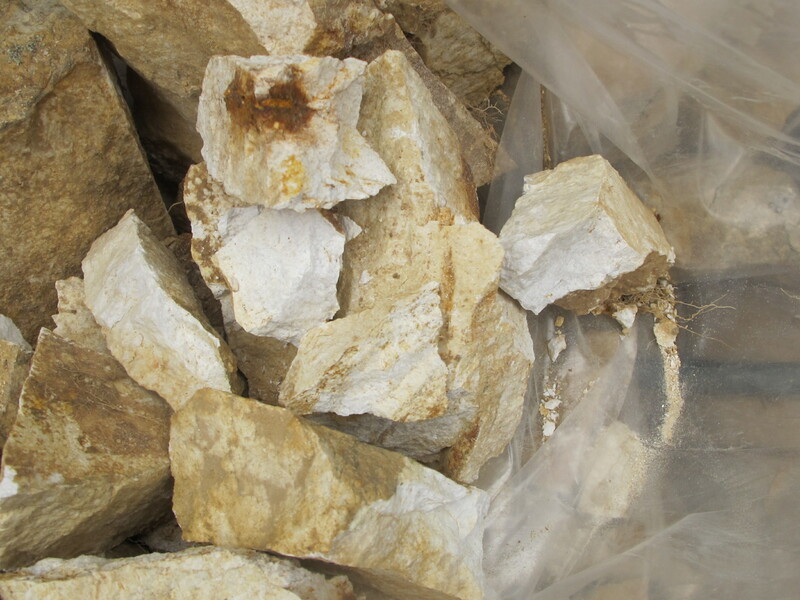 This stone is largely composed ofsericite mica, and it is special. It is reasonably rare stuff to find en-mass, in its pure white form. 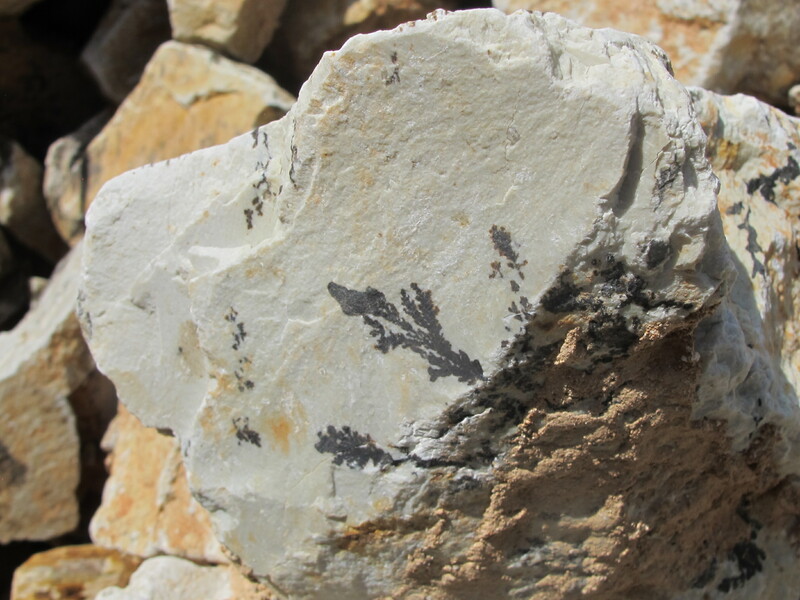 It has a flat plate-like crystal structure, not unlike clay, only much coarser. When these microscopic plates are wetted, they slide about against each other in a similar way to the way that clay does. Of course it’s so much more complicated than that, but this is a blog and not a treatise. Sufficient to say that there are very few places in the world where this kind of thing can happen. 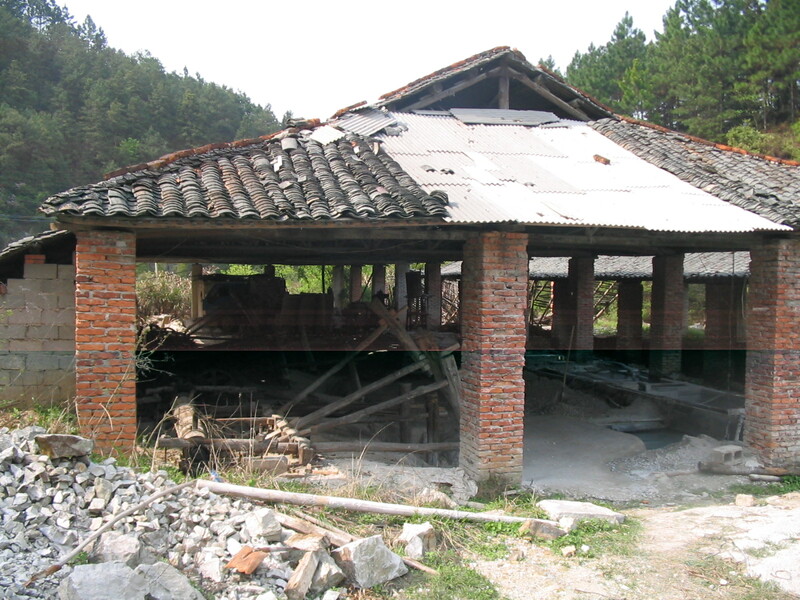 Here in China is one of them and the initial place where it was first discovered. Once the knowledge was well-developed in china, the information spread to Korea, where they discovered and developed similar materials, then eventually to Japan. When the War Lord Hideyoshi invaded Korea and brought back potters as war trophies!. My, how the level of respect for potters has fallen! I don’t recall any solder capturing and bringing back any potters as trophies from any recent wars that we have been engaged in! One of these ‘renditioned’ Korean potters discovered a similar weathered stone on the southern Japanese island of Kyushu, and so porcelain making started up there as well. I have visited these sites and made pots there and I intend to go back again and make a more substantial body of work there, just as I have done here in Jingdezhen, that I can bring back and exhibit all together back in Sydney. Hopefully at Watters Gallery. My interest in these porcelain stones is all based on the surprise discovery 15 years ago, when I stumbled upon a very small deposit of pale rock in the side of a track, out in the bush. I collected a very small sample and crushed it down to dust so that I could test it for use as a glaze ingredient. It made a lovely pale blue glaze of the family of glazes that could be described as being like ‘celadon’ or ‘guan’. These are ancient Chinese archetypes of fundamental combinations of simple ingredients. They are the simplest of glazes, but just about the most difficult to re-create with the depth and subtlety that the Chinese potters achieved at the apogee of their ceramic development, during the Song Dynasty. I recognised that my initial glaze tests, although crude, had potential to be developed into something special, but more than that I noticed that most of the tests were ‘crawled’. This would normally mean that there was too much clay in the recipe, but this recipe had no clay in it at all. It was just hard rock. Very hard rock. 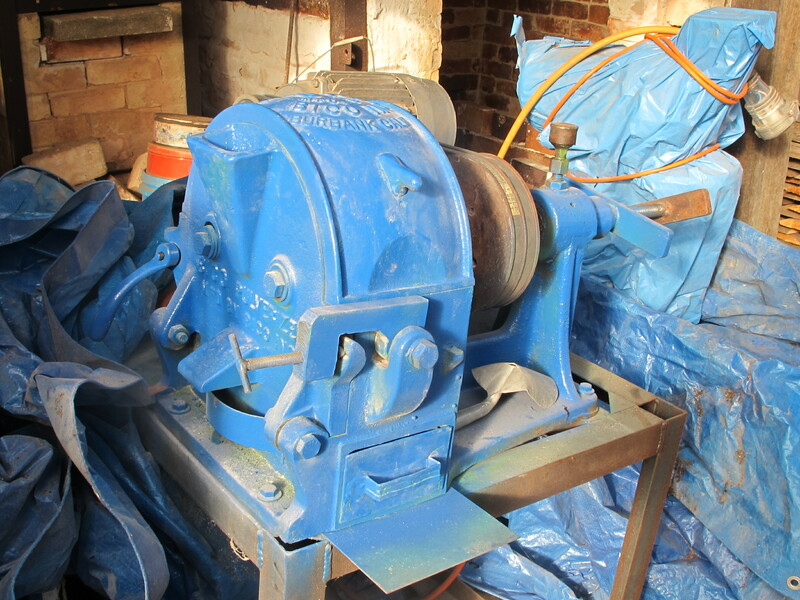 I had to use my jaw crusher, disc disintegrator and then 16 hours in the ball mill to grind it down to a fine powder. I asked myself. “How could such a hard rock have any plasticity. Does it have any plasticity?” I quickly ran to the pottery and mixed a little of the precious powdered rock dust with some water and worked it up in to a paste, then proceeded to try to throw it on the potter’s wheel into a small bowl form. It could just about be done. 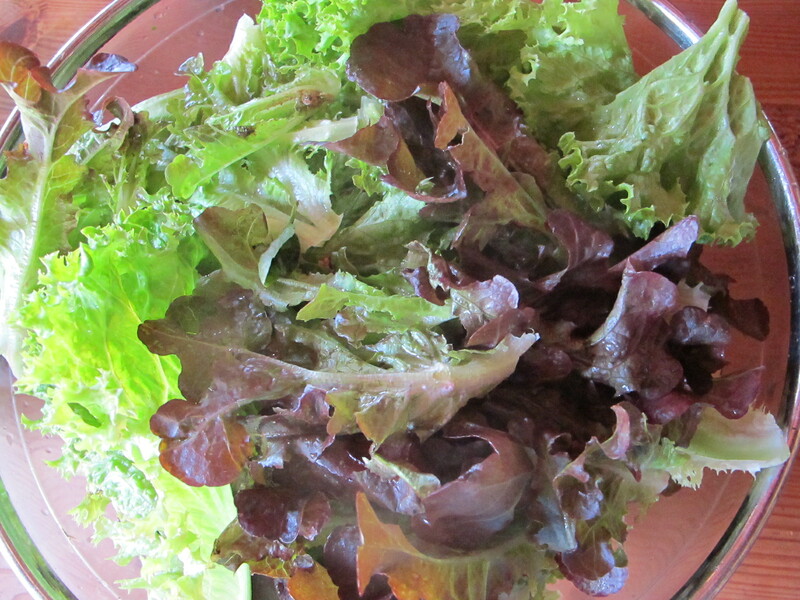 It was rough and misshapen, but it was a bowl. I fired it and to my astonishment, it fired into translucent porcelain. I coudn’t have been more surprised!. 100% rock dust and water became white, translucent porcelain! I know the date that I did this experiment, because I scratched the date into the bottom of that first pot. After 25 years of fossicking around this shire. I had finally found something really exciting and with a lot of potential to carry my work forward for a long time to come. 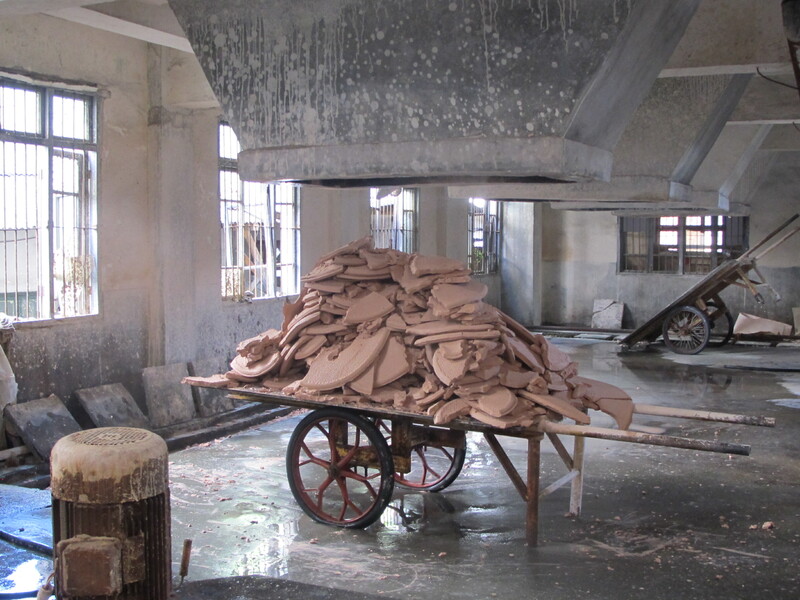 So here I am in the clay making facility in Jingdezhen. 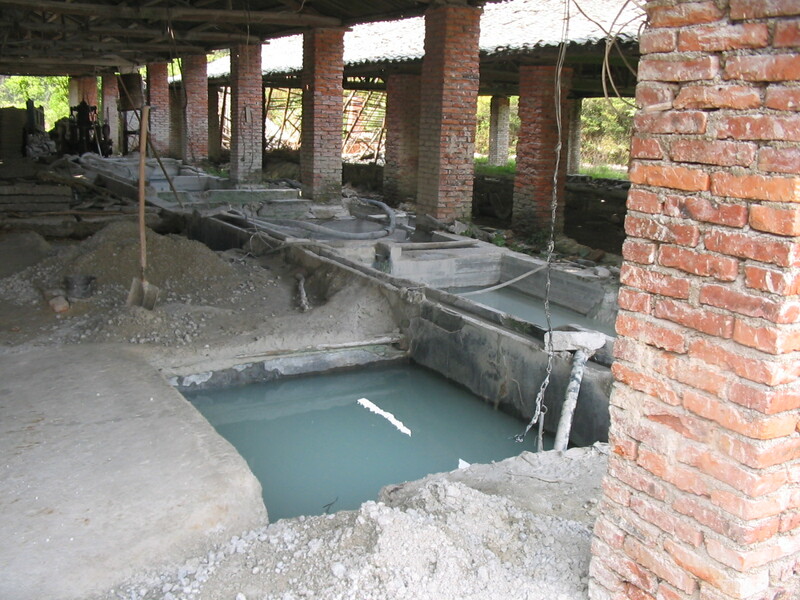 The home and origin of single stone porcelain. They don’t do all the production here anymore. Some of the large machines sit idle now. It seems that they only do the final stage of blunging (washing) the clay into a slip and sieving it through a very fine mesh to remove any unexpected rubbish that may have crept in during transport and storage. This ensures that there will be very few ‘iron’ spots in the finished product. 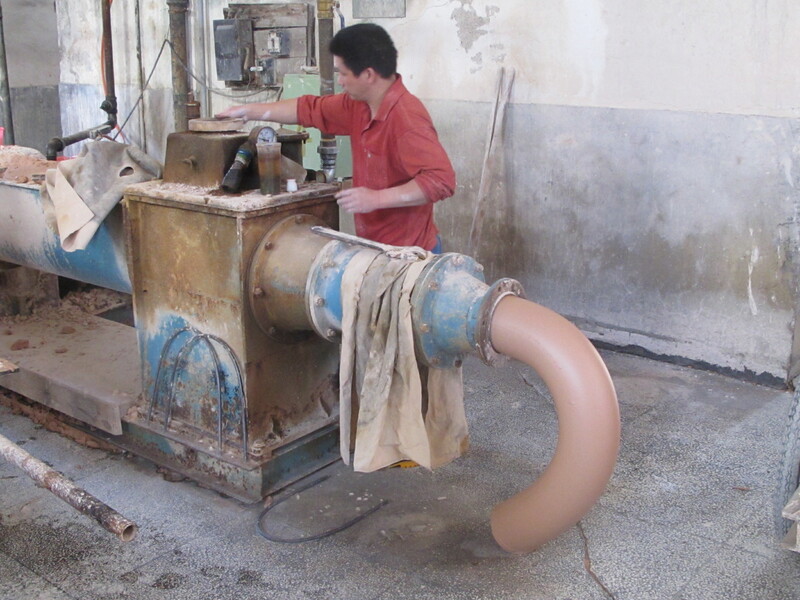 The liquid clay ‘slip’, is then pumped into a filtering machine to de-water it back to a plastic, workable state. 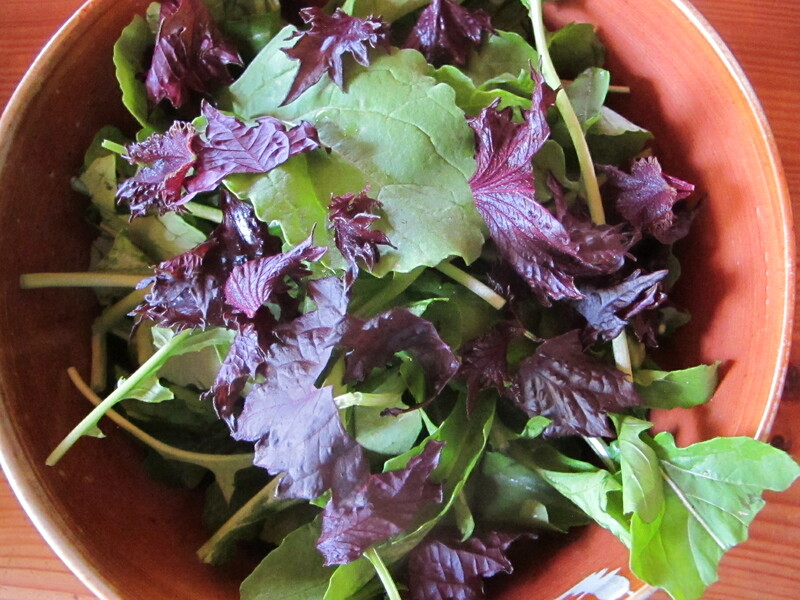 This de-watering procedure is called filter-pressing. 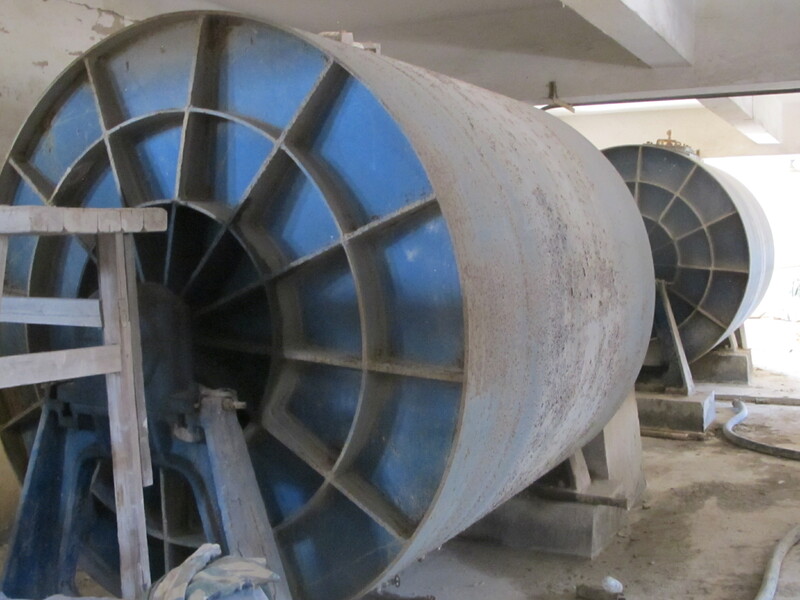 This filter pressing (stiffening) is done in very large filtration dryers until it is ‘plastic’. ie. 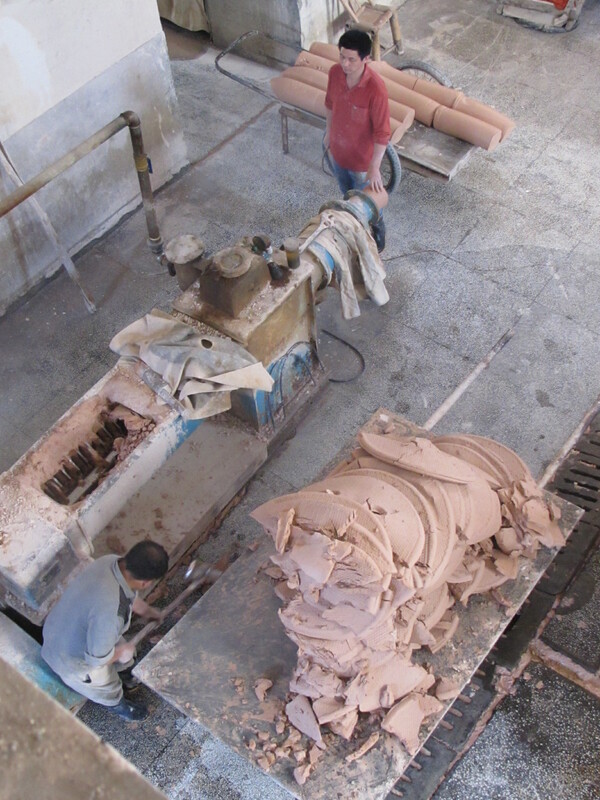 stiff enough to fashion into shapes, by moulding or throwing on the potters wheel. 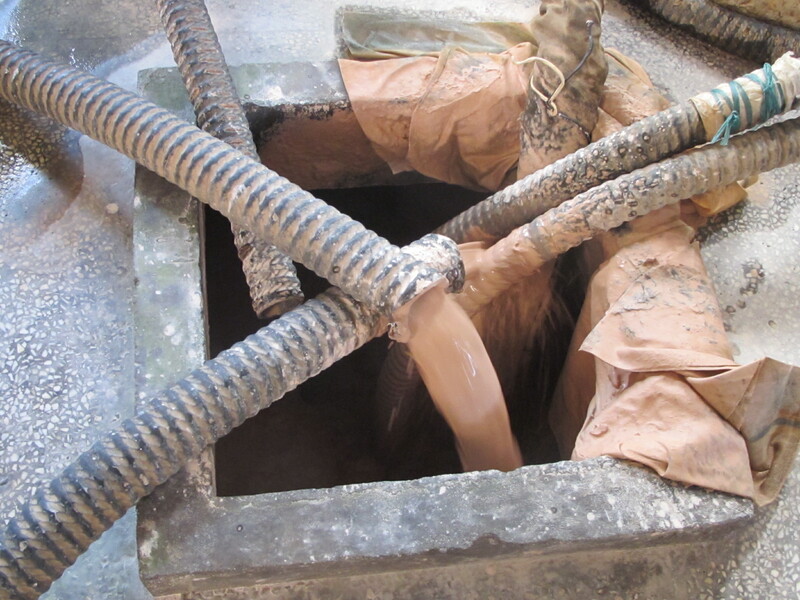 Once the clay has been stiffened in this way, it is dropped out of the filter press and is taken to the extruder, to be pugged into well mixed sausages for storage and ageing. 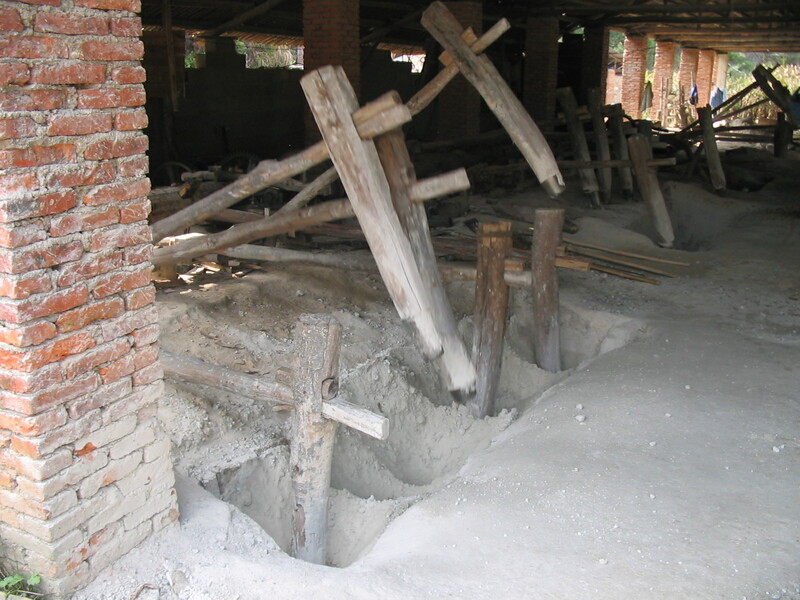 The ‘clay’ (milled stone) material is trucked-in as a partially processed material these days. 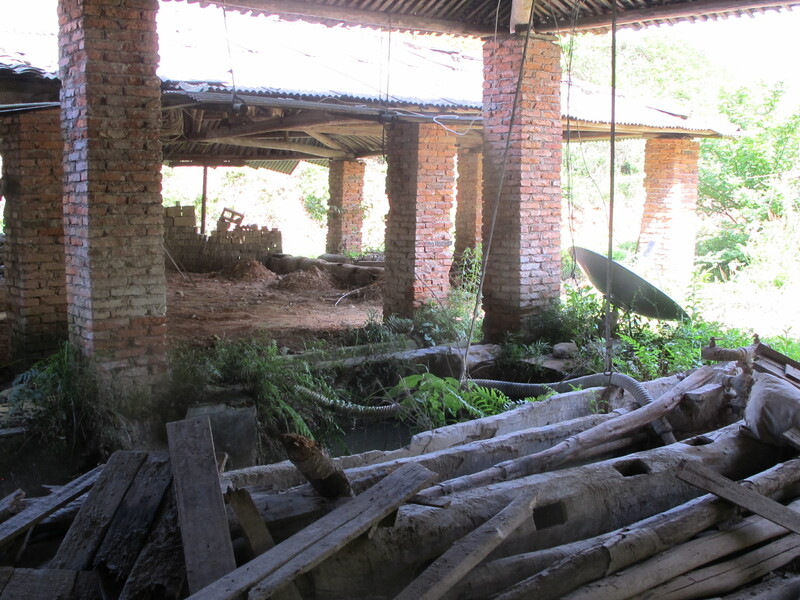 It used to be all processed here, but now it undergoes its primary crushing, milling and stiffening out-of-town, closer to the mine. 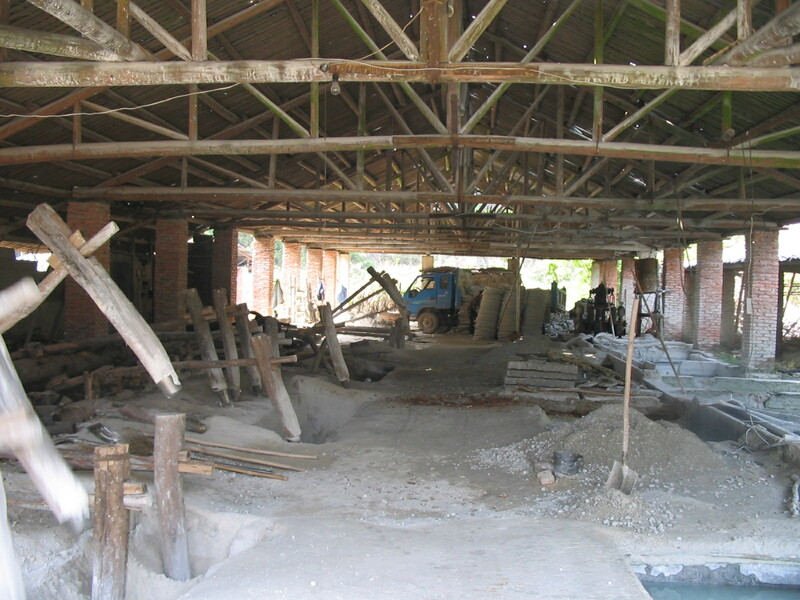 When I was here last, all of the crushing was done by water powered, wooden hammers. these were typical of the water hammers that are to be found all over Asia, where-ever there is a suitable stream and work that needs doing. 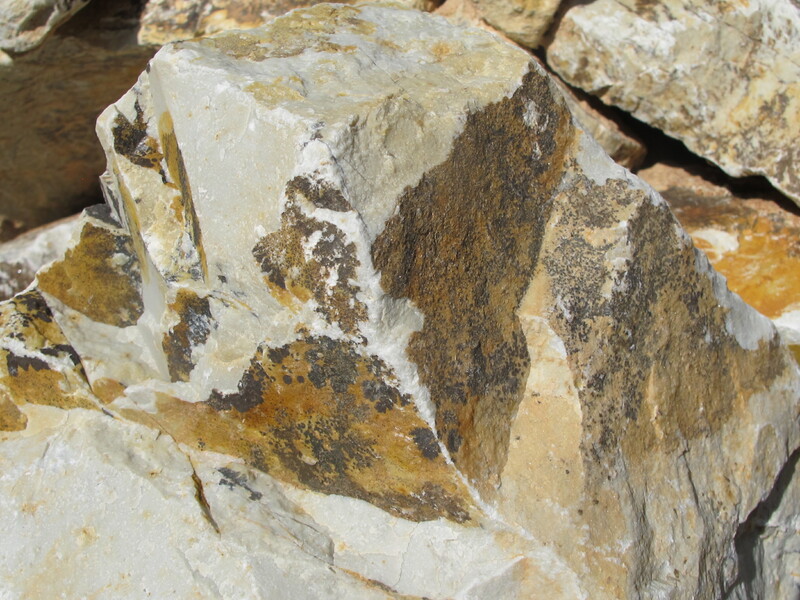 The powdered rock dust was then slaked in water and left to sit and dissociate, allowing the water to penetrate into the flakey, plate-like structure of the mineral. Breaking it down into a slurry with enormous surface area and also allowing the local bacterial to colonise the surfaces and work their magic to help enhance the workability and plasticity of the finished ‘clay’. 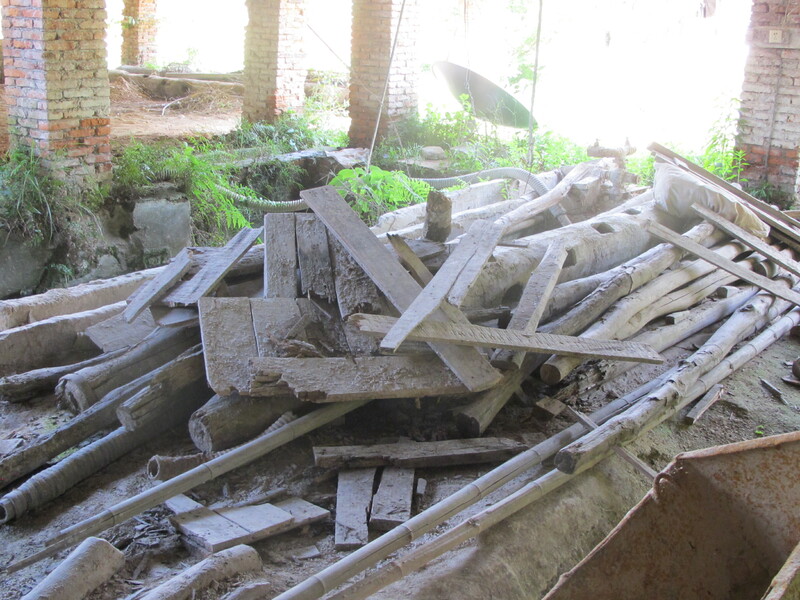 This thick slurry was then stiffened slowly in the air and eventually formed into little white blocks or bricks called ‘bai-tunze’, or ‘white brick’. 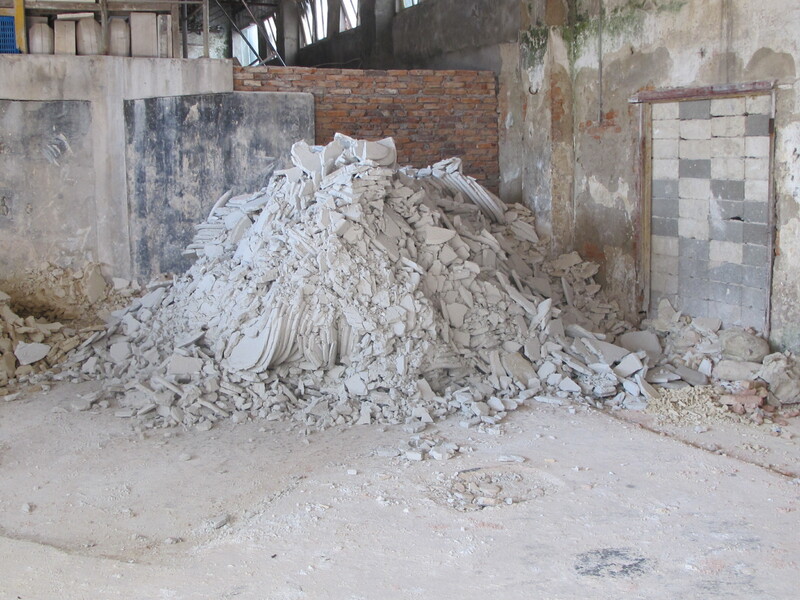 This is the form that it was delivered to the pottery clay processors. Apparently the water hammers were working here up until last year some time. 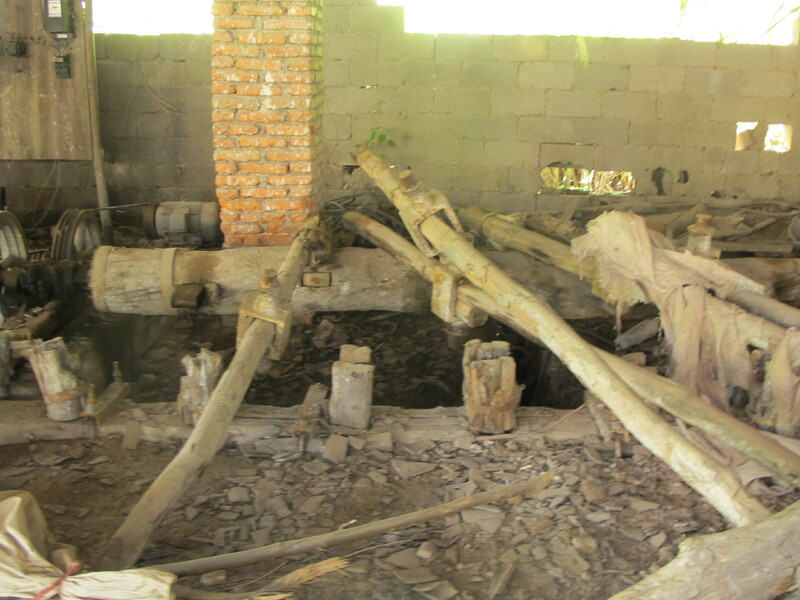 Due to pressure to increase production and through-put, these ancient water hammers were ripped out and the leats that brought the water were filled-in and concreted over. 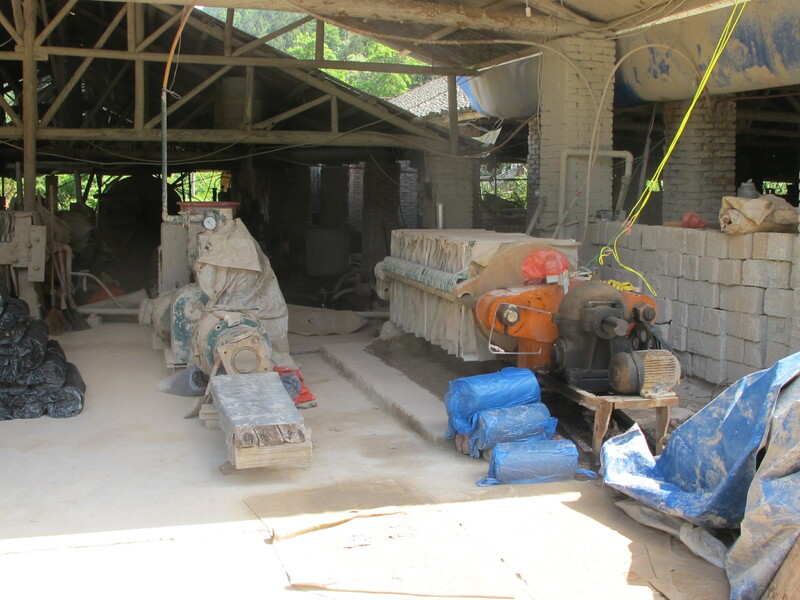 3 phase power has arrived now and all the work should be being done by jaw crusher, huge ball mills and filter presses. but when we arrive, we find the place devoid of activity. The power is down and has been all day, possibly yesterday also. and who knows when it will be restored? A lone woman sits by idly and bored and waits. Perhaps the old water hammers had some advantages? They may be a bit slow, but they ran for free and all day and night as well. So why no both? This stuff is beautiful to work with, fine and smooth and so much more plastic and supportive on the wheel. I like it a lot. Of course my stone isn’t semi-plastic sericite, it’s just plain old hard, weathered, aplite. A quick cooled acid rock. It doesn’t become very workable without a lot of effort and time applied. However, I have found that after 6 years of storage in a cool dark place, it comes out not too different to the fresh stuff from Jingdezhen. I just need to buy some time! Time is the most expensive ingredient in my work. Warning! 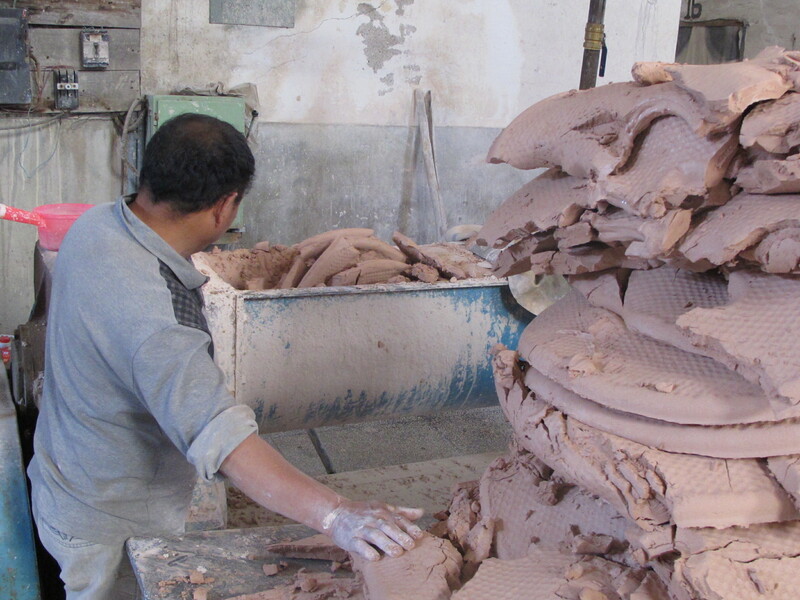 This post could be very boring if you are not a potter – and maybe even if you are? Contains technical terms and traces of nuts. 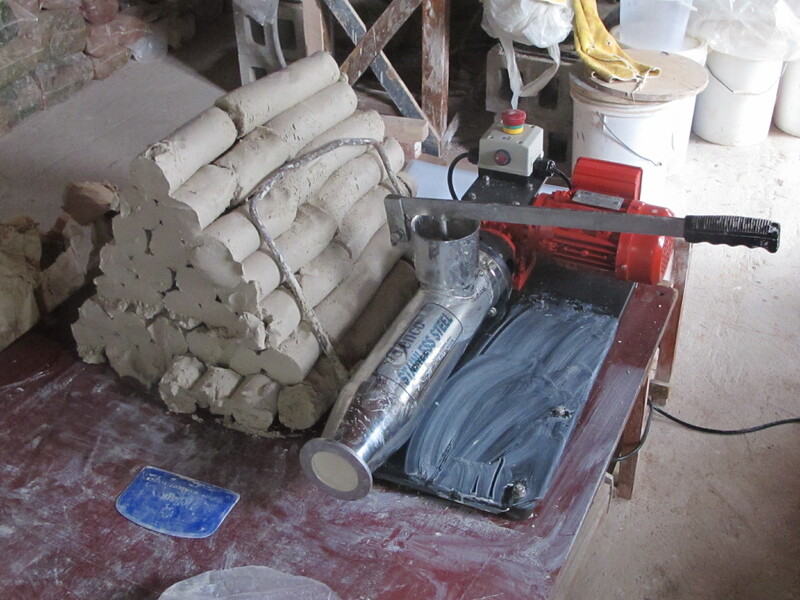 Making clay while the sun shines is a very good idea and ought to be possible in summer, but not this summer. This has been the most amazing summer that we have had for many, many years. It’s hot, just like every year, but this year it has rained more than we can remember for a long time. We are having a great time. The rain combined with the warmth has made everything grow its head off. 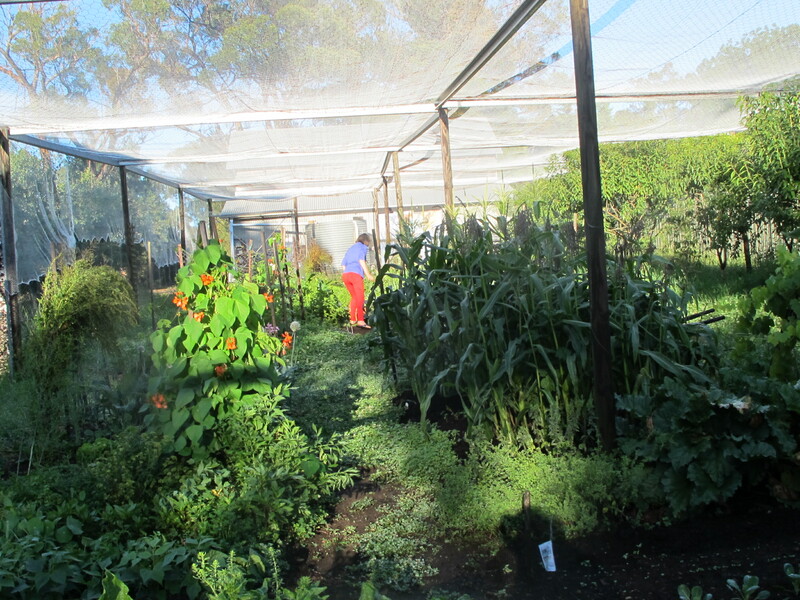 We have plenty of water in the dams and drinking water tanks, plus lots of food coming from the garden. 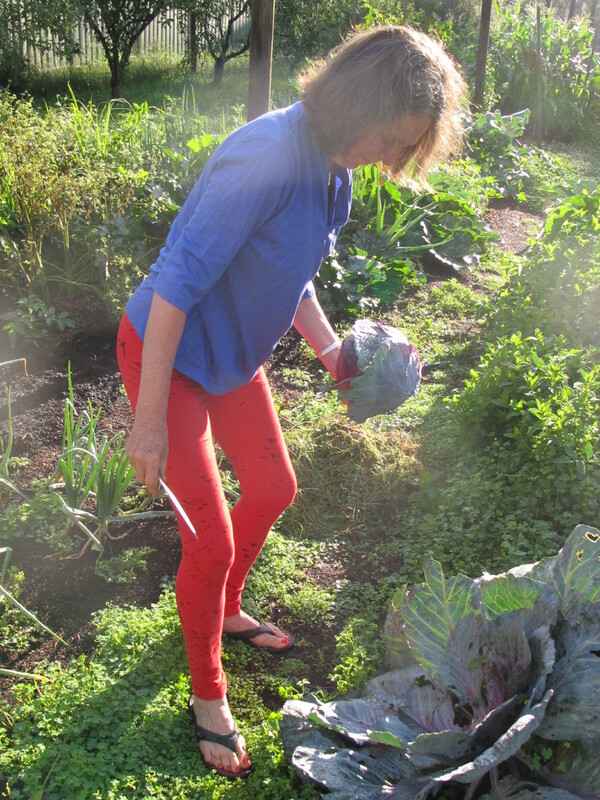 We only have to water the garden every few days, as it usually rains in between at some point. Sometimes it rains hard enough to wet the soil sufficiently that we don’t need to water for a few days. Earlier in the summer it was raining very hard and very often, but now that pattern has changed to occasional showers. So it is now dry enough under cover to get my milled porcelain stone slip to dry on the drying beds and in plaster basins. I’m aware that it is not wet like this everywhere. There are bush fires raging down south, while I’m clearing ditches to guide the excess water away from the pottery. When it is this wet, the humidity is so high that it is very hard to dry liquid clay slip. 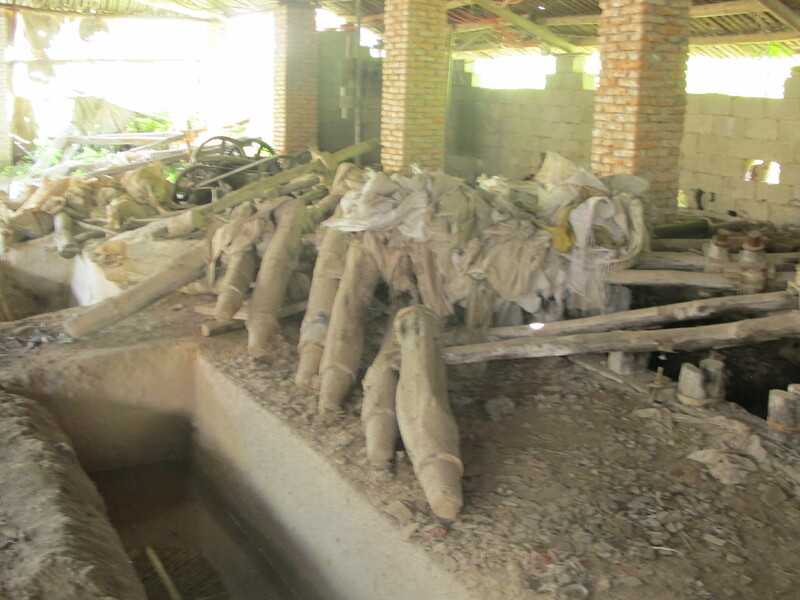 It just tends to sit there and go mouldy while rotting the fabric membrane underneath that separates the clay from the brick bed. After 40 years of pursuing my project of self-reliance, I have decided to modify slightly my fundamentalist, hard-line approach of ‘total commitment to maximum achievable’ self reliance, to a more relaxed and flexible approach of ‘substantially committed to’ self-reliance. In this regard I have recently decided to allow myself some slack and buy in more processed product to allow for an easier life as I age. 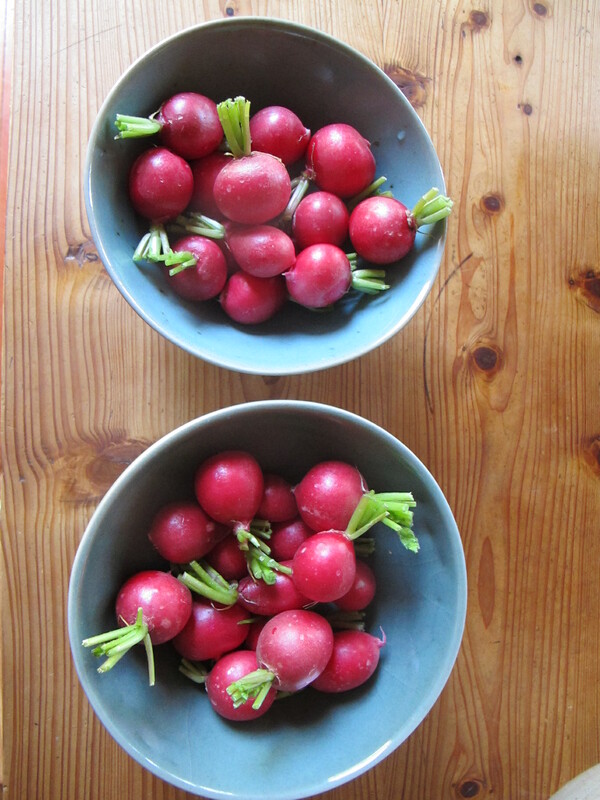 For example, When I returned from my studies in Japan, late last spring, it was getting a bit late to put in seeds and start a summer garden from scratch, so I decided to compromise and buy some punnets of vegetable seedlings to get the garden up and growing, while I planted my seeds and waited for this second planting to come along as a second, follow-up crop. 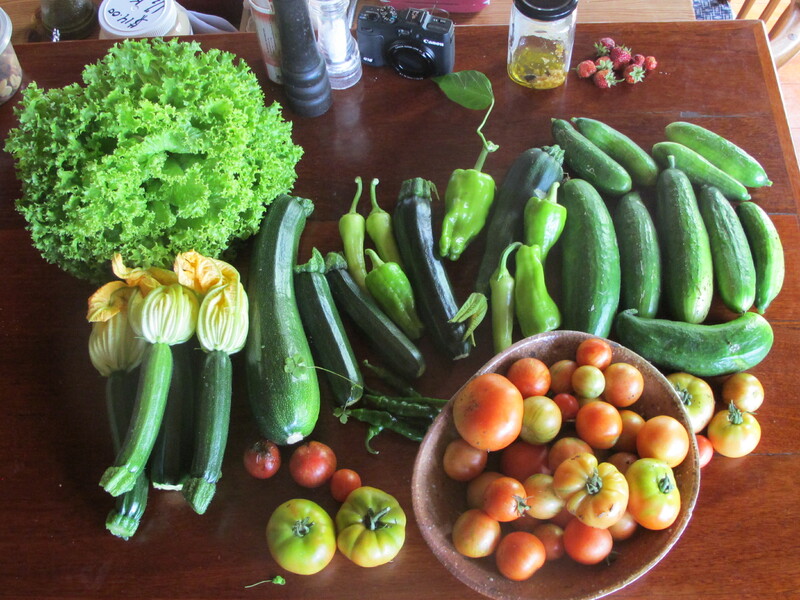 This worked well and I’m very pleased with the serried plantings and how they are growing and providing a steady flow of tomatoes, sweet corn and zucchini etc. It’s a small compromise, but once compromised, why not go with it? 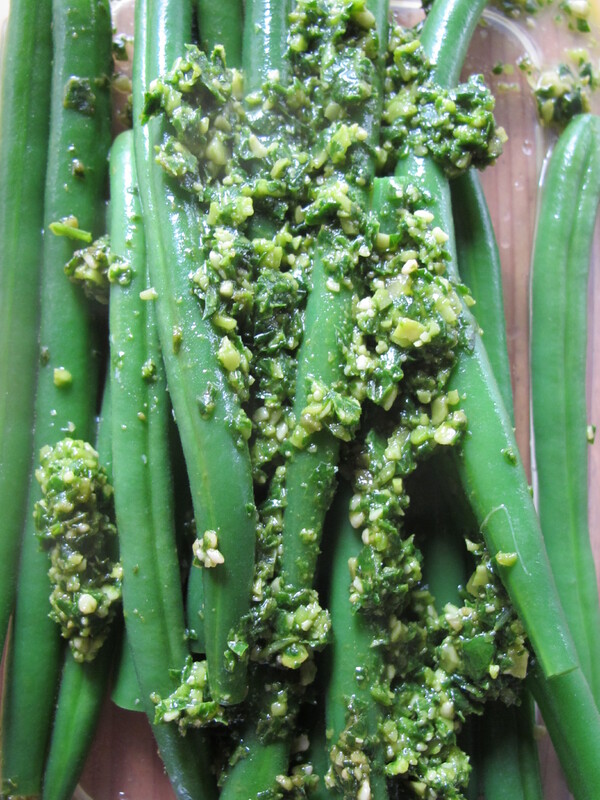 Blanched French beans served with fresh, home-made basil pesto. I have decided now to addapt this freer approach to my ceramic materials and my creative work. I have previously only used the rocks, shales and clays of my own local shire and I am still completely committed to this ‘local’ concept. I had found during this long extended period of research that although I tried very hard to locate everything that I needed to make my ceramics from only the materials that I discovered around me. I could not find any pale plastic throwable clay in a quantity that was useable. However, what I did find, was plenty of hard igneous rocks to make glazes and in the end I managed to make two really special, unique and very interesting stoneware clay bodies from self-processed, local rock dusts. 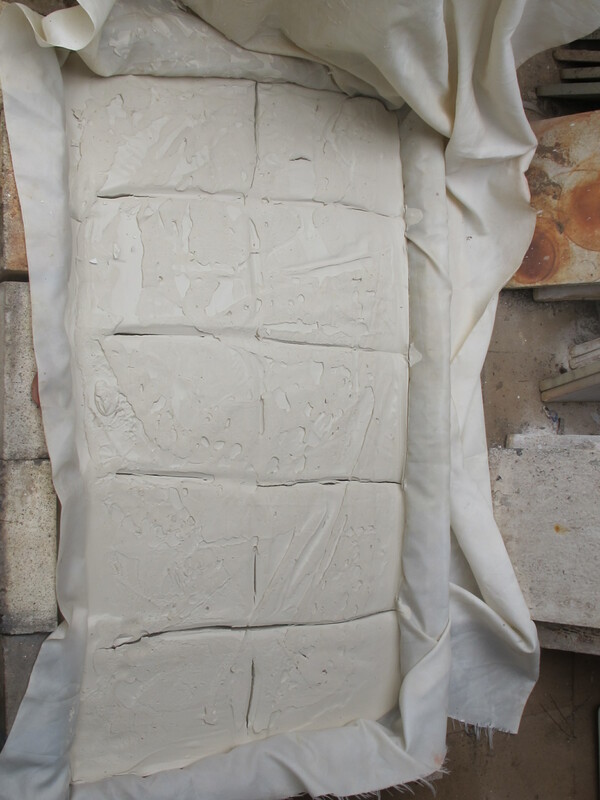 To achieve this, I realised that I would need to add some bentonite (a very sticky clay) to bind and slightly plasticise these powdered rock bodies to make them useable. 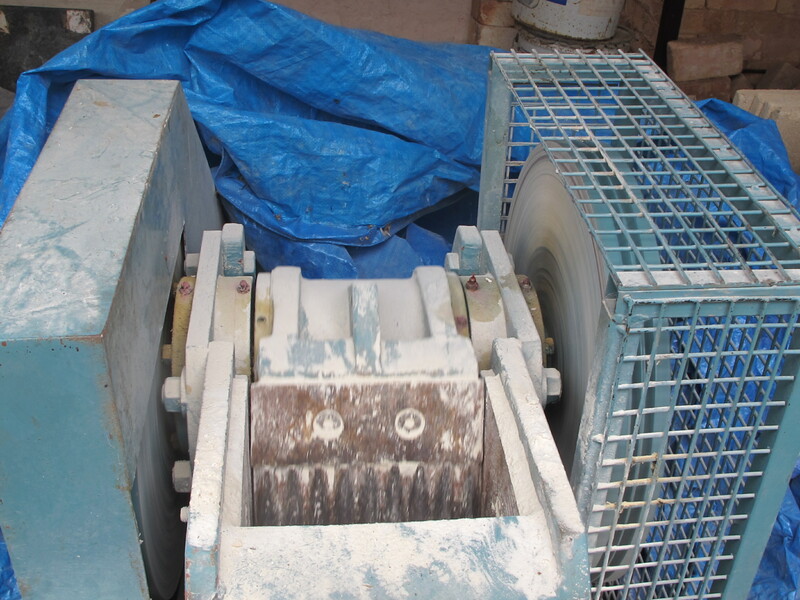 These rocks are so hard, that they need to be crushed first in a large jaw crusher, then a small laboratory jaw crusher and following that I put the grit through a disc mill and finally in the ball mill for 16 hours to get it really fine. 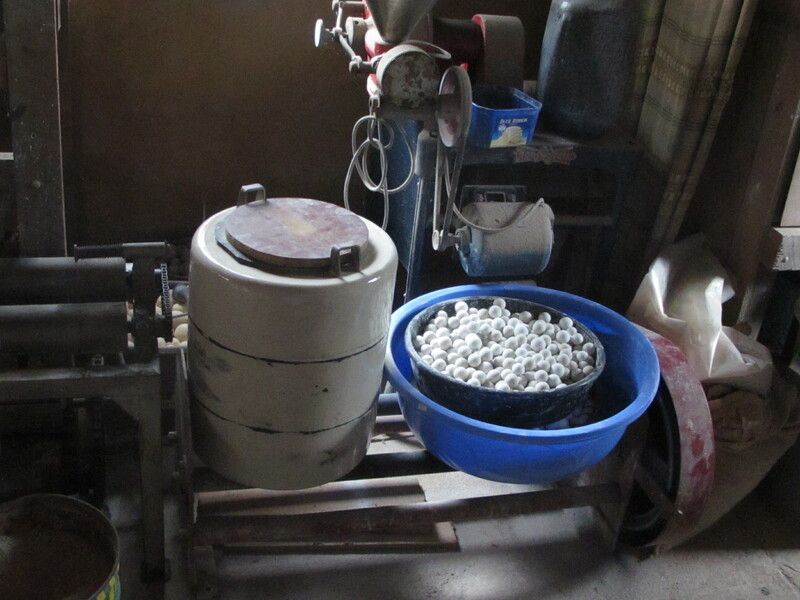 Using this rather slow, convoluted and old-fashioned technology, that I obtained as industrial cast-off, from auctions and junk yards, I can process my finds from large rocks down to 200# powder in about 24 hours. It’s the drying out of the liquid clay slip from the ball mill that is taking the longest time and slowing the process down. Not helped by the continuing wet weather. I never thought that I’d find myself complaining about rain! Warning, there are traces of nuts showing in this image! I pass the thin liquid slip through 100# sieve before settling out the solids. So, bentonite was my first compromise. It may not be local, but it is Australian. I have bought 3 x 25 kg bags of bentonite during my career. I also found that I needed to buy in alumina powder to use as shelf wash. This wasn’t absolutely essential, it was just very much better than all the alternatives, so another compromise. I’m still using this original 25 kg. bag of Al203. I use it sparingly, so It will last a very long time. Recently, I decided to get some kaolin to add some slight increase in plasticity to my ground up local native porcelain stone bodies. 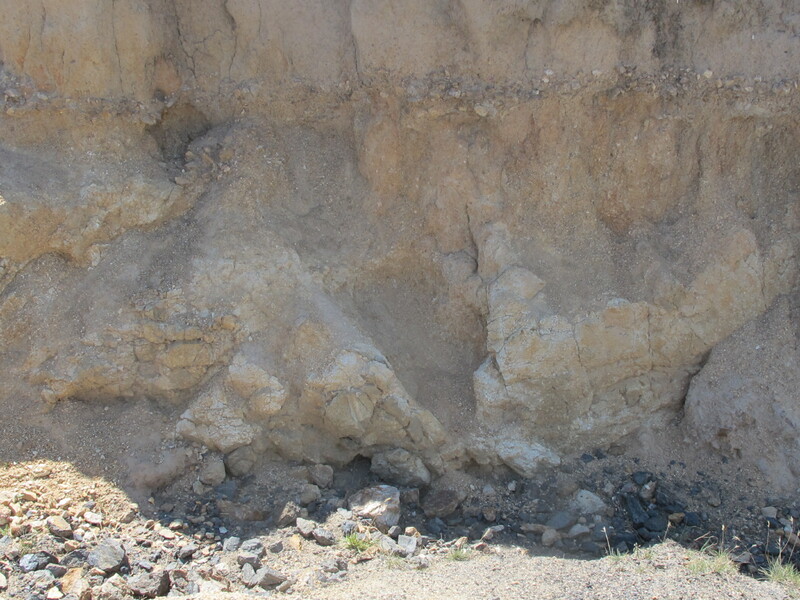 This is not a local material either, as it comes from 300 kms away, but it’s closer than the bentonite. There must be something closer, I just haven’t found it yet. Proceeding on from my initial tests. 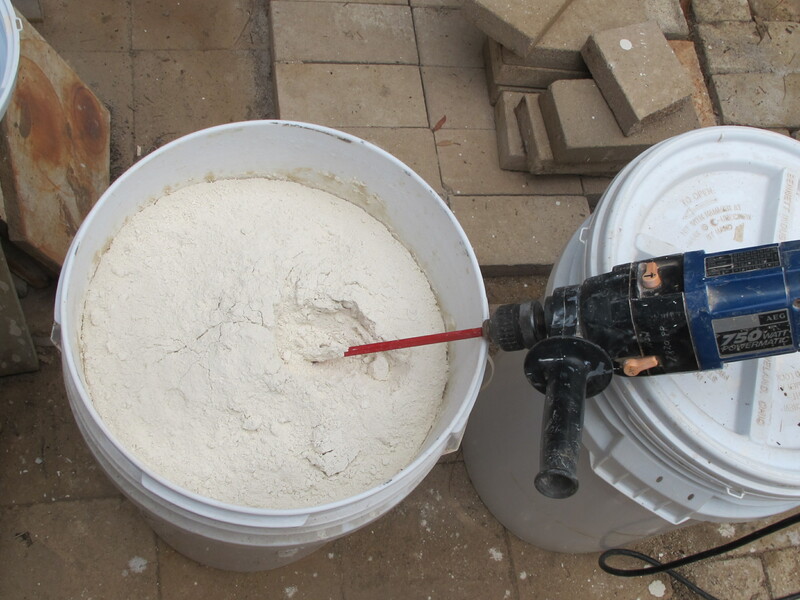 I have decided to add 15% of this plastic kaolin to my ground porcelain stone body, it makes an enormous difference to it’s workability very quickly. I completed the first small batch tests of 5 kg each last year, before I went to Japan. 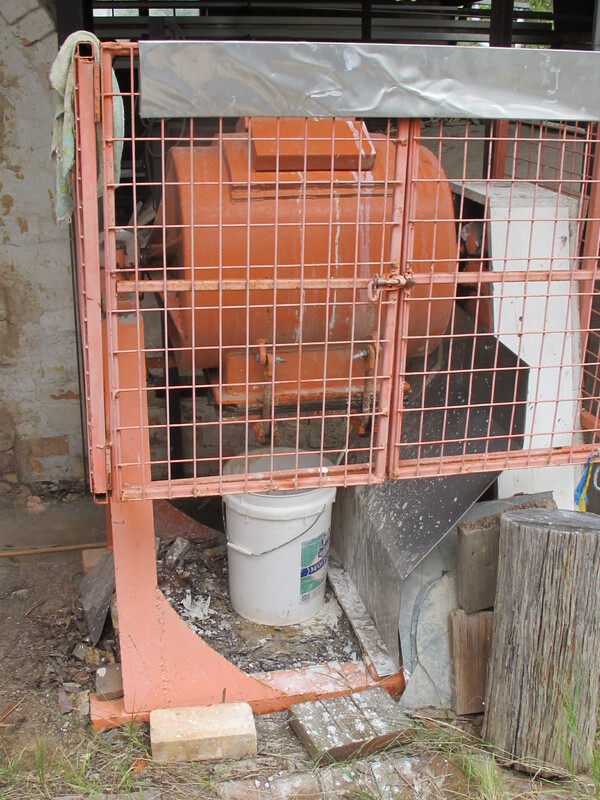 So now I am making the larger 100 kg batches to see how they work on a larger scale. The tests were very promising, so I am eager to see them perform and feel them on the wheel. I was encouraged to follow on with this blending idea when I saw them making their porcelain body in Arita in Japan recently, using imported New Zealand kaolin. But I’m not prepared to go that far for some kaolin. 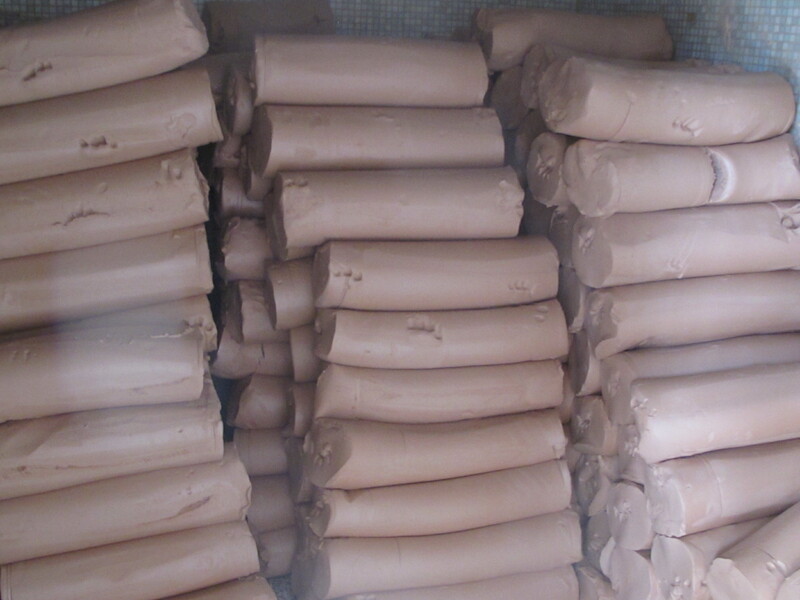 I have been told that the most famous porcelain body in Australia, which is exported all over the world, is made from Chinese kaolin, Indian felspar and American bentonite. At least the water is Australian! 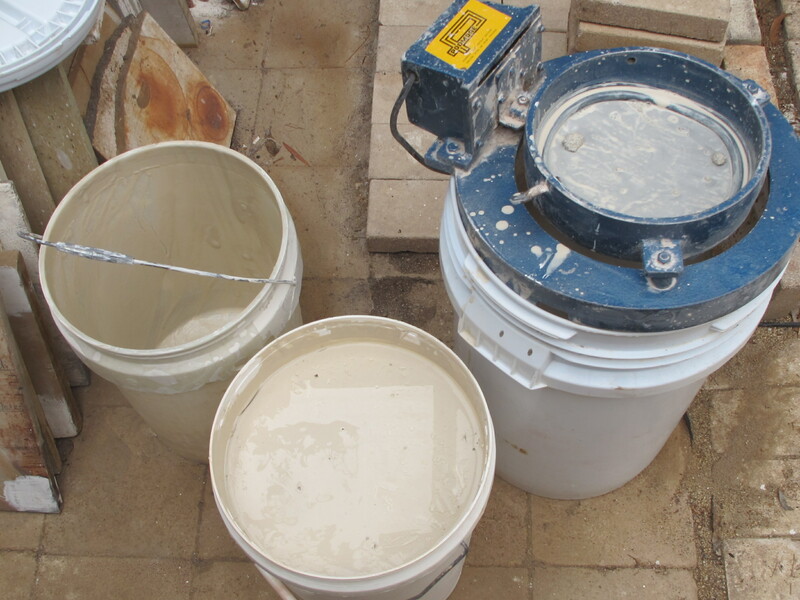 To aid the drying process of my ball milled (bai tunze) porcelain stone slip, to a stiff plastic, usable porcelain body, I make two batches. 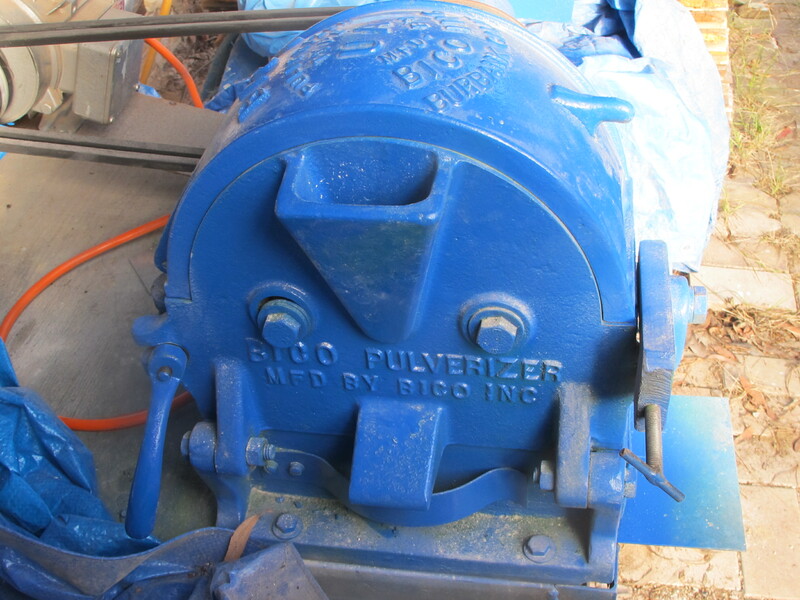 One of 30 kg in the big ball mill as a liquid slip. 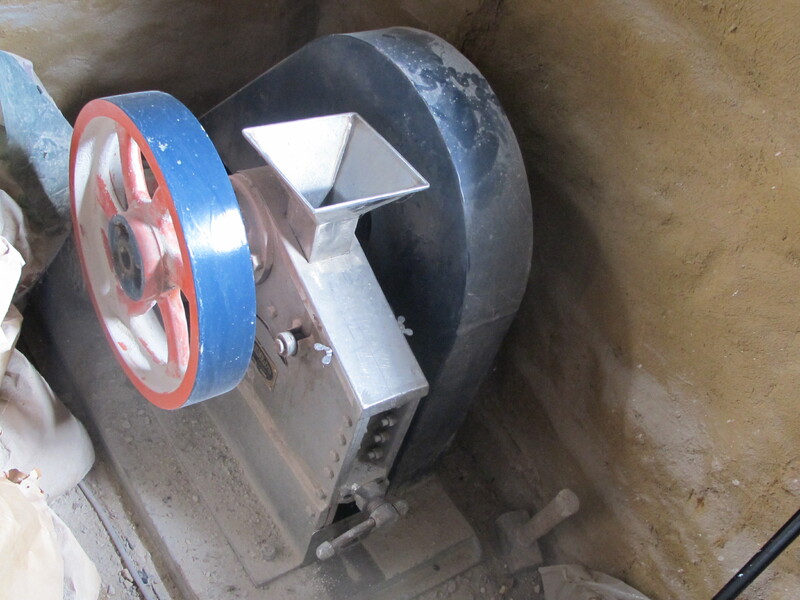 This slip has to be thin enough to allow the grinding down of the very hard rock granules from the crushers. After milling I allow the thin liquid to sit and settle for a day or so, to allow the very fine ceramic fragments to flocculate. I drain off the free water from the top of the settled clay material. At the same time I make a second 5 kg. 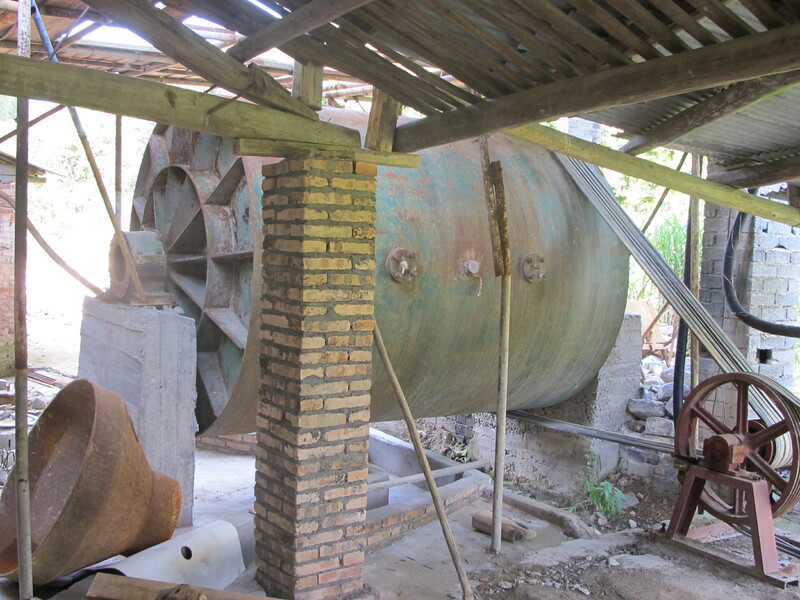 batch in the smaller ball mill which is dry milled. 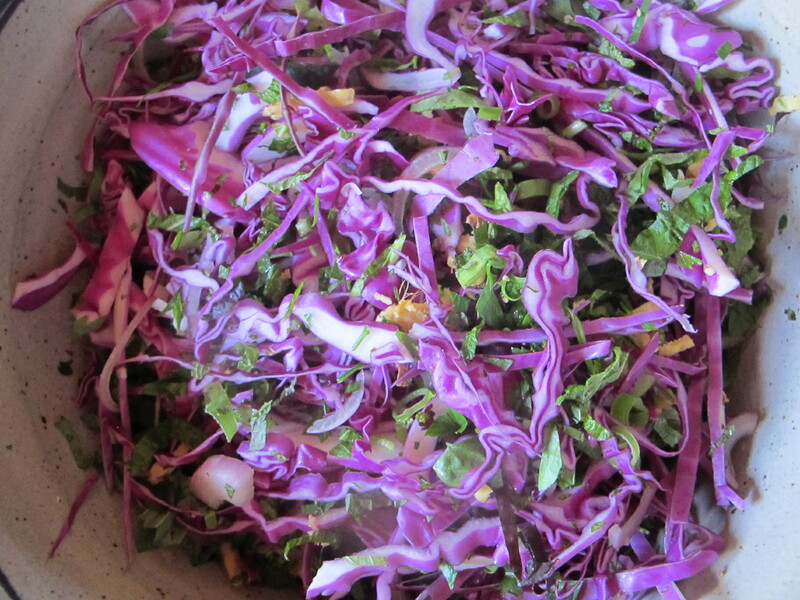 I then add this dry material to the wet batch and mix them together. This significantly stiffens up the slip. I can then put it out on the drying bed or plaster tubs to firm up. I drag my finger through the stiff slip to make it dry into usable square plastic blocks that are easier to pick up and store for pugging. However, because of the very wet summer continuing on like it has, I’m finding that the clay just won’t dry as usual. The humidity is just too high. I’m having to lift the very soft plastic mass off the sodden brick drying beds and place it in the open air to get a little air movement over it to finish it off to a stiff plastic condition. 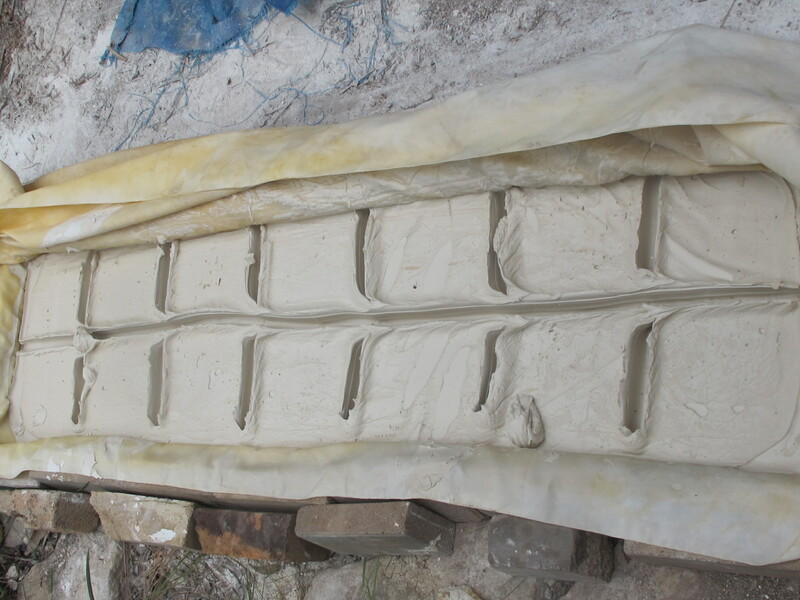 Perhaps the extra 15% of kaolin content is slowing the drying a little as well? 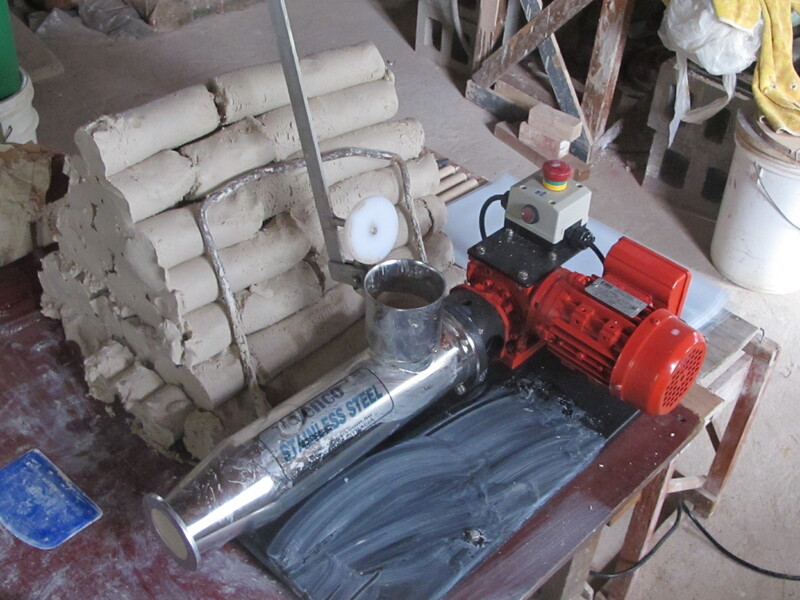 I have been using my new ‘VENCO’ stainless steel mini pug mill to pug the small batches of clay. It’s fantastic, quiet, fast for it’s size and ideal for small batches of porcelain body like the stuff that I’m making. And so much easier on my wrists than hand wedging. As part of this sudden loss of intellectual rigour and convenient relaxation of my philosophical standards, I hope to make my life a little easier in my latter years. However, I can’t help somehow feeling a bit like the philosopher Bertie Russell reneging on his death-bed. I am fully aware that this is where the similarity ends. I am no philosopher, and hopefully I am not on my death-bed either – just yet. I just feel like I need to extend my range and have the ability to work with an extended palette of interesting materials for my creative work. 15% of non-local kaolin isn’t going to change the fabric of my work in any noticeable way, but it will make the act of throwing a lot more pleasurable for me and extend what I can make. So I have decided to start using materials that I have discovered that are outside of my shire and my previous 50 km radius of interest. Over the last 20 years I have experimented with my immediately available local materials, non of which are mentioned in McMeekin’ s book. I have worked on them to the point that I couldn’t think of any more variations that I could make to gain any further insight into these materials. Only extreme ageing could improve their plasticity, I’m too old to wait for that solution to work for me. I’d taken these materials as far as I could imagine. Another potter would certainly find new things to do with these materials, but I feel that I have lived and worked on this restricted palette for long enough. I want to experiment with some ‘new’, and therefore interesting materials that I don’t know anything about. To this end, I just went to collect some felspar from a site that I came across a few years ago, near my friend’s house, it’s 150 kms away. I only sampled it at that time, because it wasn’t within my target area, but it looked very interesting all the same and I can’t pass an interesting bit of soil by without at least looking at it and taking a preliminary sample. The initial testing proved that it was felspar and although quite weathered, it still has quite a bit of alkali, so it might turn out be very useful. I’m extending my range, making more flexible choices and hopefully making my life a little more interesting and a little easier. I have a few different projects in mind for the future.